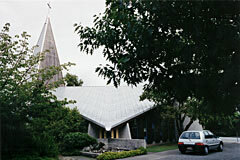 Our Lady of Lourdes is a church by an architect who is confident and assured and is John Scott at his best. 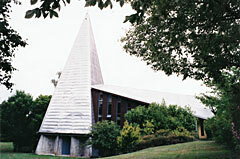 It is both grand and simple at the same time. 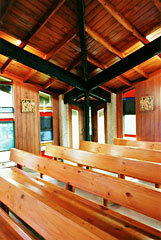 It has features that are reminiscent of the Futuna Chapel but it is also completely different. 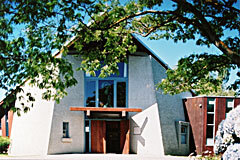 Built on a sloping site, the church is still securely connected to the earth. Like a good sculpture it is complete from every angle and the geometric complexity is not revealed immediately but slowly, after repeated visits. 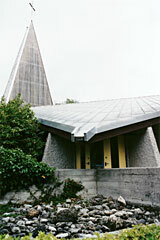 As in the Futuna Chapel, there are wonderful contrasts of material, from the solidity of the cast concrete entrance to the shiny metalic steeple. 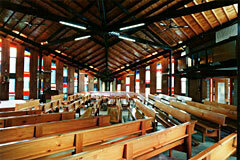 Coloured acrylic glass panels let light into the interior and contrast with dark wooden panels. 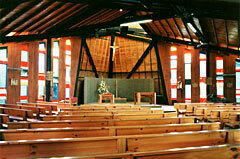 The roof is supported with heavy wooden beams that meet in the centre and form a star. 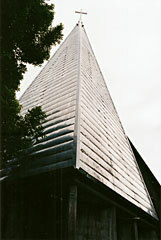 The two northern sides of the steeple have acrylic slats that cast dramatic light onto the crucifix and altar. 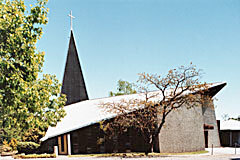 Our Lady of Lourdes was modified in the nineties, with a supposedly sympathetic connecting structure on the western side. 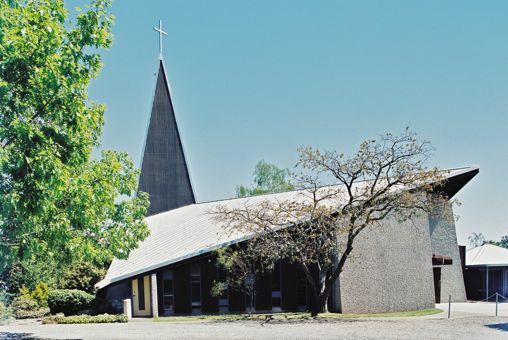 This has destroyed the geometry and the wholeness of the church and is a crying shame. 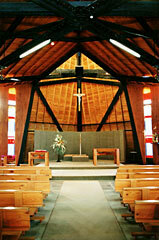 This building was always meant to stand alone, the symmetry of the church one of its strengths.